Default page template displays the content on the left and the sidebar on the right. Classic scheme. Centered page template disables the sidebar and puts the content in the middle of the page. Fullwidth template also disables the sidebar but uses the full width of the site for the content. Portfolio — Jetpack template displays a grid of portfolio projects registered with Jetpack’s Custom Content Types module. There is no need to use [portfolio] shortcode on this page. Portfolio grid will appear automatically. Portfolio — Portfolio Toolkit template displays a grid of portfolio projects created with Portfolio Toolkit plugin. Blog Archives is a built-in template for creating archives page. It shows ten latest posts, archives by month, year and subject. Available with the paid version of Maker. 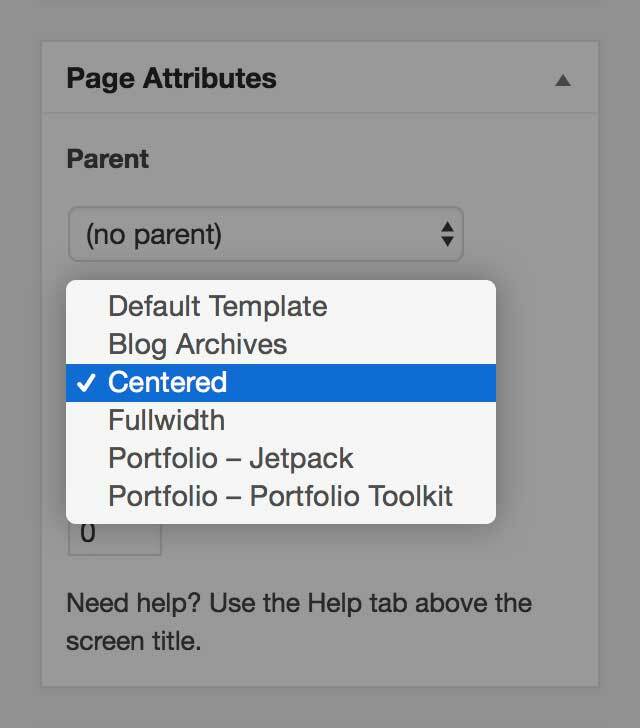 You can select the template for a page using the select box in the Page Attributes widget.